If you had to name the two material things that are most important to you, you'd say money and bacon, right? Of course you would. You're sane. Lucky for you (especially if you live in Indiana), the Hoosier Lottery has introduced $2 bacon-scented lottery tickets, from which you could win up to $10,000 or -- and perhaps more importantly, depending on whom you ask -- a 20-year supply of bacon. The game, dubbed Bringin' Home the Bacon (obviously), is a partnership with nonprofit group Indiana Pork, WTHR-TV, Indianapolis reports. That partnership will also be bringing bacon tastings to Indianapolis, Fort Wayne, and Evansville in June and July, plus giveaways of bacon-themed prizes. 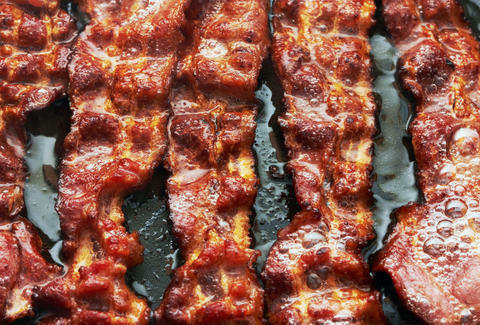 Scratch, sniff, win, and spend the rest of your life as that guy who always brings bacon to social gatherings. Which.... is not the worst kind of guy to be? Lucy Meilus is a staff writer for Thrillist and has both a gambling problem and a bacon problem. Follow her on Twitter at @Lucymeilus and send news tips to news@thrillist.com.